I decided to participate in the Political FOTD challenge co-hosted by my girl Yummy411. 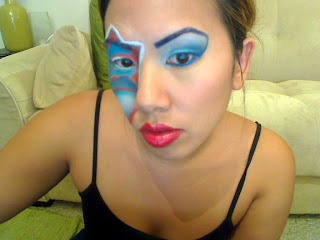 With the election amist us, I thought it would be fun to do a makeup look using the good old red, white, and blue. I did it late last night. 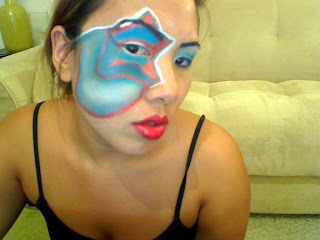 It started as a star on my eyes and grew into a KISS/phantom of the opera/US flag FOTD. It was fun doing crazy makeup. Next time I do something like this, for Halloween perhaps, I'll spend a little more time to get my lines straight and a little more precise...I was trying to hurry because my boyfriend make chicken wings and they were waiting for me, lol. So hope you enjoy, and don't forget to exercise your right to vote! I love it! the colors look so creamy and soft! I know right, i think i have a cold cuz i slept with the windows open last night. get ready girl! boot season! Wow! This was unexpected. I love the creativity. It's very 3-D and cool. Ooooh I looove it. I actually thought about putting a star on my face but that would have been a disaster so I admire your skill! vote vote vote! yes plz email me a cruise packing list cause i'm a dork! Girlfriend, this is hot!! Love your skills. Thanks so much for joining in on our challenge. Have a great weekend! Nice! I love the Makeup Art! YOUR LOOK IS GREAT AND EXTREMELY CREATIVE. IT LOOKS WONDERFUL!!! damn sOOoo creative! i need to get myself those mehron palettes! but i dont think i can come up wit these great ideas like u gals... I LOVE THIS ! Hi ren-wow, very nice indeed, good luck my dear!! That is sooo pretty!!! I love it!! I love the colors, very creative! Girl that is so artistic!!!! WOW!